SAT. 11/14 CLASS AT TAROT ART & TATTOO GALLERY IN SONOMA, CA! Just a reminder that I’m going to be teaching a class on using charms with the Tarot at Kristine Gorman’s Tarot Art & Tattoo Gallery (http://www.tarotarttattoo.com/tarot/) in Sonoma, CA on Saturday 11/14 from 1:00 pm to 5:00 pm. Yay!! I’m so excited! This class will teach you to use charms with your tarot cards to help narrow things down a bit, giving you direction and some clarity & maybe even a new way of seeing the cards as you work with both systems of divination. For more info, call Kristine and Shotsie at (707) 938-3000. The gallery is at 17977 Highway 12, Sonoma, California 95476, a short drive north of San Francisco. Call Kristine and Shotsie to reserve your seat, because seating is limited. Workshop price $125. $25 non-refundable deposit required to reserve seat. We’re going to be doing some ancestor divination as well, since we’re so close to Samhain. Call to sign up today! Hey guys! I’m going to be teaching a class on using charms with the Tarot at Kristine Gorman’s Tarot Art & Tattoo Gallery (http://www.tarotarttattoo.com/tarot/) in Sonoma, CA this November on Saturday 11/14 from 1:00 pm to 5:00 pm. Yay!! I’m so excited! This class will teach you to use charms with your tarot cards to help narrow things down a bit, giving you direction and some clarity & maybe even a new way of seeing the cards as you work with both systems of divination. For more info, call Kristine and Shotsie at (707) 938-3000. The gallery is at 17977 Highway 12, Sonoma, California 95476, a short drive north of San Francisco. Call Kristine and Shotsie to reserve your seat, because seating is limited. Workshop price $125. $25 non-refundable deposit required to reserve seat. We’re going to be doing some ancestor divination as well, since we’re so close to Samhain. So call to sign up today, and November 14th come out and play! 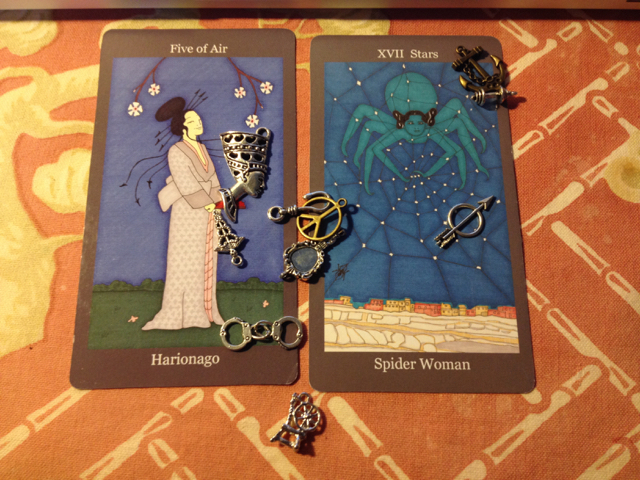 Sometimes when we deal out the cards in a reading, it takes a little while to figure out what they’re trying to say. With so many potential meanings available to us for each card, especially if we read reversals, it can be challenging to know which meaning is intended at which particular draw, and how those meanings relate with other cards. This class will teach you to use charms with your cards to help narrow things down a bit, give a little extra direction, provide additional clarity, and maybe even give you a new way of seeing the cards themselves. Charms are an increasingly popular form of divination in which symbolic items, or even everyday hum-drum items, are infused with meaning and cast across the cards. Using charms in this way can help provide clarity and add an extra layer of depth to your readings, whether you’re reading for yourself or for others. Please bring your favorite tarot deck with you. If you have charms, please bring them to the class as well. But never fear if you don’t. Little everyday items will be provided that you can use as charms to get you started. Come and join the fun! The class is $35. Call The Sacred Well to register. Thanks and bright blessings to you!